dry off your strawberries, and the bigger you can get them the better. Holding the top of the strawberry, dip it in the white chocolate up to your fingers, coating the whole berry. Set aside to cool and harden while you do as many more as you want. Once cooled and the chocolate is hard, dip them in the dark/milk chocolate carefully at an angle so that chocolate creates a diagonal edge across the flattest front of the berry. Now do the otherside, creating a V shape. With a toothpick, draw a bow tie at the top of the white chocolate triangle remaining, then 2-3 buttons below it. Voila Mr. 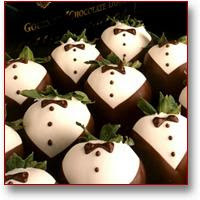 Tuxedo Strawberry. Now go impress your mom or seduce someone. p.s. too much refrigeration causes the chocolate to fall off the berry. Bonus Useless Trivia Moment: A strawberry is the only fruit with its seed on the outside.